E-commerce companies in the Yangtze River Delta region initiated a regional industrial alliance in pursuit of a shared bright future at a meeting focusing on the Internet-plus economy held on Thursday in the Pudong New Area. Industrial leaders in Shanghai and the provinces of Jiangsu, Zhejiang and Anhui said they hope to enhance cooperation, dovetail strategies and blaze new trials so as to make the Yangtze River Delta region an emerging force in the global trade landscape. Details will be further discussed. Pudong plays a major role in the city's development in the e-commerce sector. 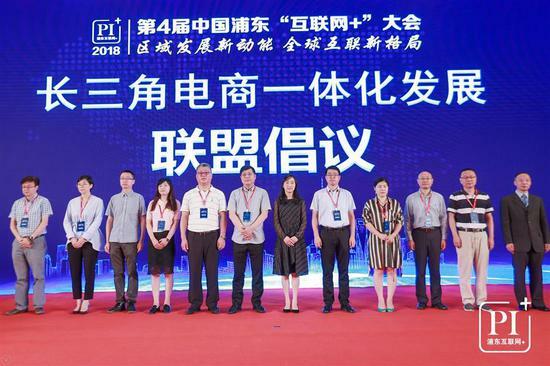 At the meeting, Wanxiang International Innovation Harbor, a technology startup incubator and cross-border e-commerce cluster site in Pudong's Hangtou Town, was honored by the city's commercial authority as Shanghai's model industrial park for e-commerce. Wanxiang is the second of its kind in Pudong to be granted the title, following Tangzhen Town E-commerce Innovation Harbor. "We hope it can drive a new round of development in the e-commerce sector in Pudong," said Liu Min, deputy director of Shanghai Commerce Commission. "And we will show full support to the Pudong government's efforts to build great business ambience and activate the e-commerce market." Pudong is home to 111, Inc., the first Chinese online health care platform to be listed in the US, and online pet store Boqii, China's only pet industry player to be listed by the Science and Technology Ministry as a unicorn enterprise. The 2018 Pudong Internet-plus Meeting was held by Pudong's commercial authority. Officials, executives and experts explored how to achieve better integration between traditional industries and emerging technologies at the meeting.